With vastly increased volatility and some precipitous down days, equity indices have been giving some investors heartburn. For the Elliott wave trader, that volatility can mean opportunity. We believe the major U.S. equity indices are nearly finished with a fourth wave correction, and that prices should climb up to new highs in coming weeks or months. 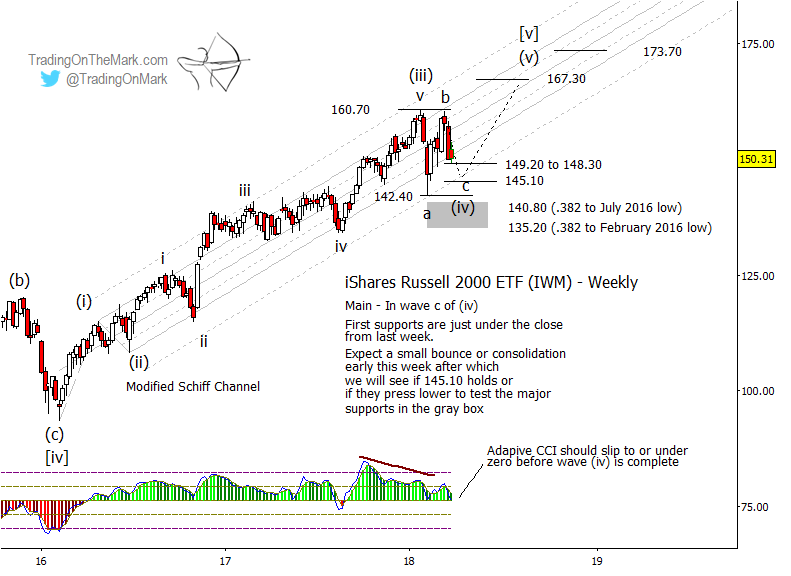 This is a quick update to our February post about the iShares Russell 2000 ETF (NYSE Arca: IWM). We also want to alert readers to a special offer where you can lock in a permanent 15% savings on any TOTM subscription. In the sequence counting upward from early 2016, the recent correction in IWM has behaved as a fourth wave should. It tested important channel-related support (the 50% harmonic in February) but it quickly moved back into the main part of the channel. The abrupt decline of sub-wave ‘a’ of the correction was bought quickly, which produced a sizable rally ‘b’. Now we watch as bears try to push downward in sub-wave ‘c’. We don’t believe bears will get very far. The internal structure of ‘c’ appears almost complete just as price is ready to test the first support area near 149.20 to 148.30. That area or the next support at 145.10 could allow wave ‘c’ to make a higher low than ‘a’. As a backup plan, if 145.10 fails as support we would watch for a test of the zone between 140.80 and 135.20, which represent to viable Fibonacci 38.2% retracements. Our preferred momentum indicator – the adaptive commodity channel index – appears almost ready to test the zero-line. That event often coincides with a reversal. Based on Gann methods, preliminary upward targets for the expected wave (v) of [v] include 167.30 and perhaps even 173.70. We will refine those targets when it becomes clear that wave (iv) has found durable support. Use TOTM’s services to get daily updates on a variety of markets with the option for intraday trading support too. Our frequent updates typically include the S&P 500, crude oil, gold, the Euro, the Dollar, and bond futures. If you act now and use the coupon code “Elliott” you can take advantage of this special offer to lock in 15% savings on any of our services.